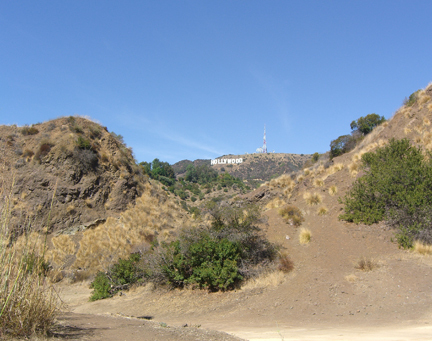 Los Angeles is home to many movie and television show filming locations. 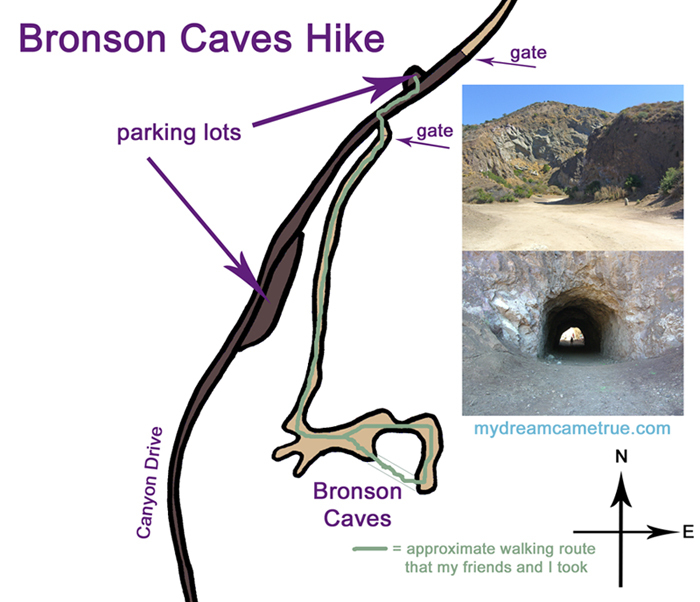 One of my favorite ones to visit is Bronson Caves. 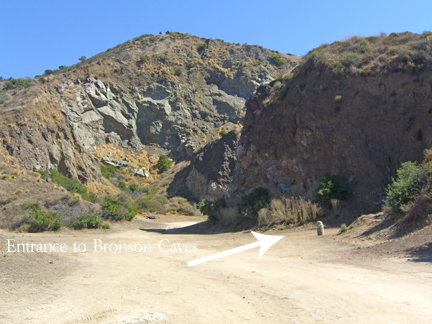 Bronson Caves played the role of “the Batcave” in the 1960’s movie and the television series, Batman. I remember the thrill of discovering the caves for the first time. My friends and I parked in a small parking lot at the far north end of Canyon Drive, inside Griffith Park in Hollywood. We walked south on Canyon Drive until we saw a gated road to the left. We slipped past the gate and walked up a dusty, dirt incline. Less than half a mile later, we entered a large clearing. As we approached the rocky hill toward the center, we spotted a small opening in the base. We had found the Batcave! The entrance to the Batcave was instantly recognizable, but instead of looking into a dark cave, we found ourselves looking straight through the “cave” and out the other side, because the Batcave is actually a tunnel! 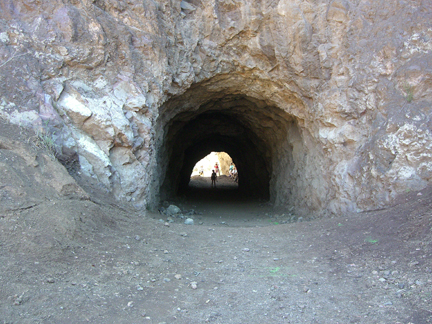 Entering the cave/tunnel instantly transported me millions of miles from Los Angeles. The rocky walls and dirt floor strewn with rubble enveloped me. I ducked inside one of the small tunnels branching away from the large main tunnel and climbed back out into the bright Southern California sunshine. There, I was treated to a great view of the Hollywood Sign in the distance to the northwest. Over the years, I’ve returned to Bronson Caves many times. Occasionally, I've found the area around them filled with trucks and a crew filming a movie, commercial or television show. During one visit, my friends and I watched the filming of a scene for the television show, Private Practice. Even when there’s nothing filming at Bronson Caves, it is always fun for a quick visit. I also like to hike all the way from the Batcave to the Hollywood Sign. Note that, in the summer, this shade-free hike can be brutal. I did this most recently in 2017 in Hollywood, California, USA. P.S. You can hike from the Batcave to the Hollywood Sign! Check out a map here, or grab one of the T-shirts below. P.P.S. The novel Lost in Los Angeles (about a traumatized young woman who travels to L.A. looking for a reason to live) includes the Hollywood Sign hike as well as other bucket-list-worthy L.A. adventures. Check out Lost in Los Angeles by J.W. Lynne on Amazon.com. 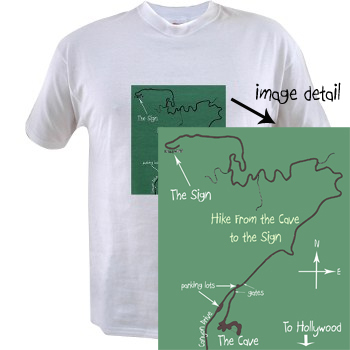 Batcave to Hollywood Sign Hike map T-shirts and water bottles are available at Cafepress for men, women, and children! This hike generally takes me about 30 minutes round trip when I walk at a relaxed pace and only spend a few minutes at the caves. I would estimate that the hike is about 1 mile round trip. Driving directions to trailhead: From the intersection of Hollywood Blvd and North Bronson Drive, head north on North Bronson Drive. Continue on North Bronson Drive until it becomes Canyon Drive. Enter Griffith Park and park in one of the parking lots just before the gate at the end of Canyon Drive.